Greystone Guns over barrel centrefire silencers are designed to provide maximum noise and recoil reduction. Manufactured in New Zealand to be as light and as small as possible using high quality materials to ensure a long life. Greystone Guns has conducted extensive research and development for its new K-Baffle range of centrefire silencers and they are now ready for sale. 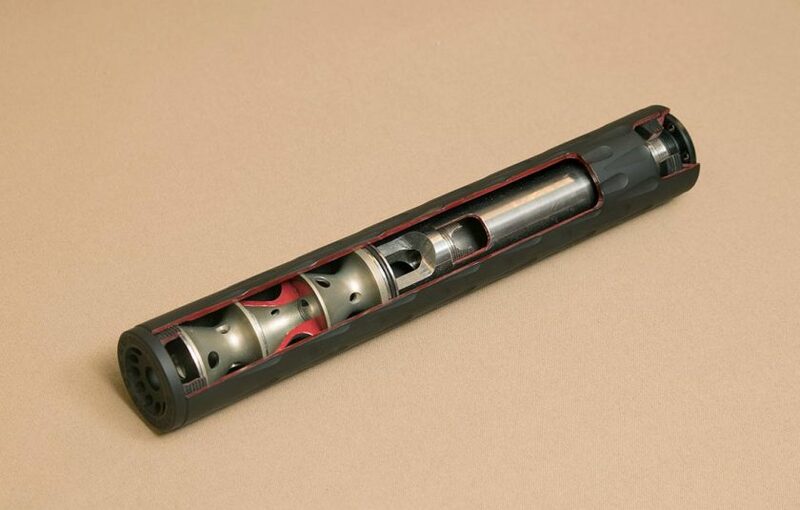 The unique design of these over barrel centrefire silencers incorporate a high flow internal muzzle brake that directs a large portion of the high pressure firing gases into the over barrel section of the silencer. The remaining firing gases then pass through the front section of the silencer where the very efficient K-baffle stack dissipates and delays the exit of the firing gases. During testing these silencers have proven to be very efficient at reducing noise and very effective at reducing recoil. These centrefire silencers also achieve that now, in a much smaller sized silencer, than was possible before. The superior design of these silencers has been achieved by using previous silencer manufacturing knowledge and by using technology like computer aided design (CAD) programs and finite element analysis (FEA) programs. To ensure that all parts of the silencer fit together perfectly, remain within tolerances and have a superb surface finish, they have all been machined using computer numerical control (CNC) machines. By using the FEA programs and simulating the applied firing stresses that occur inside the silencer during firing we were able to complete a complex multi physics structural strength analyses of all the individual components of the silencer. This information then allowed us choose the most suitable materials to make each part from and to ensure that it would match the particular stresses that occurred in that part of the silencer. Each component was then designed and machined to be as light as structurally possible for the particular type of material it is made of. Various combinations of differently designed internal muzzle brakes and K-Baffles were tested and the ones that recorded the best DB reduction were identified and used. To verify the computer aided structural integrity theories, high quantities of ammunition in various calibers was fired through the different model silencers. This testing confirmed that their structural integrity was very good and that they were strong enough for their rated calibers. Examination of the internal components of the test fired silencers also showed no signs of any premature wear. The Greystone Guns 3K model K-Baffle silencer is the smallest centrefire silencer that we produce with our new K-Baffle Technology. Available in 4x different projectiles sizes. 17 – 224, 243 – 260, 270 – 308 and 338. This silencer is suitable for calibers up to 30-06 case capacity. Due to certain restrictions on silencers, we are unable to sell or ship these to some countries, please contact us regarding any questions you have about international orders. The Greystone Guns 4K model K-Baffle silencer is our most popular centrefire silencer. Available in 4x different projectiles sizes. 17 – 224, 243 – 260, 270 – 308 and 338. This silencer is suitable for calibers up to 300 Win Mag case capacity. The Greystone Guns 6K model K-Baffle centrefire silencer really starts to show its benefits on the magnum sized calibres. Available in 4x different projectiles sizes. 17 – 224, 243 – 260, 270 – 308 and 338. This silencer is suitable for calibers up to 338 Lapua Mag case capacity. The Hunter the Magnum and the Magnum XL model over barrel centrefire silencers are our original silencer design and are available to suit three different size projectile groups for centrefire rifles up to powder capacity of 300 Win Mag. This means you can effectively use the same silencer for any calibre within the projectile size bracketing. You can also use projectiles smaller but they will not get quite the same decibel reduction as they would if they were in their designated bracketed area. 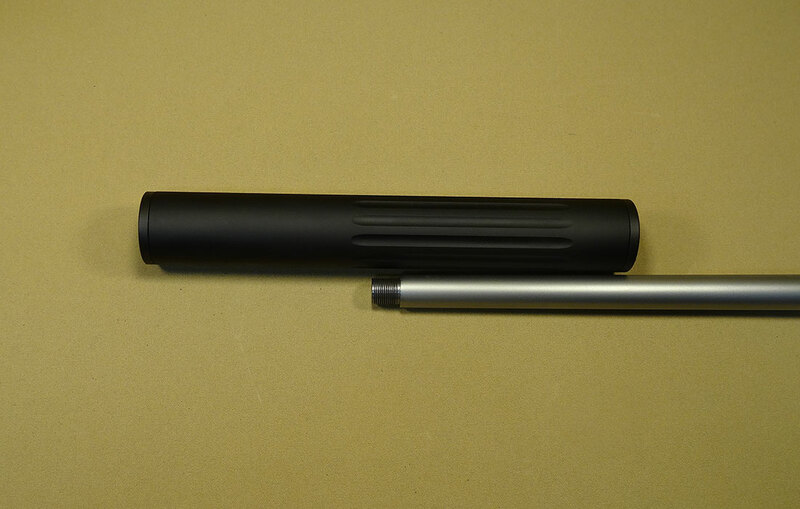 The silencers have a removable Acetal Plastic rear bush which needs machining out to the barrel diameter. Spare bushes are available for $30 so you can easily use the same silencer on different calibres (within the projectile size grouping) and with different diameter barrels (the thread size/type must be the same on all barrels though). The silencers have an internal tube called an isolator tube that seals the blast and gases inside the silencer, so there is no problem using these silencers on fluted, octagonal or hammer forged pattern barrels. The standard size isolator is suitable for barrel diameters up to 19mm at 125mm rearwards of the muzzle for the “Hunter” model, 200mm rearwards for the “Magnum” and the “Magnum XL”. Barrel diameters larger than 19mm and up to 22.5mm require the heavy barrel isolator tube upgrade which costs $50 extra and uses a 5/8 UNEF 24 TPI barrel thread. 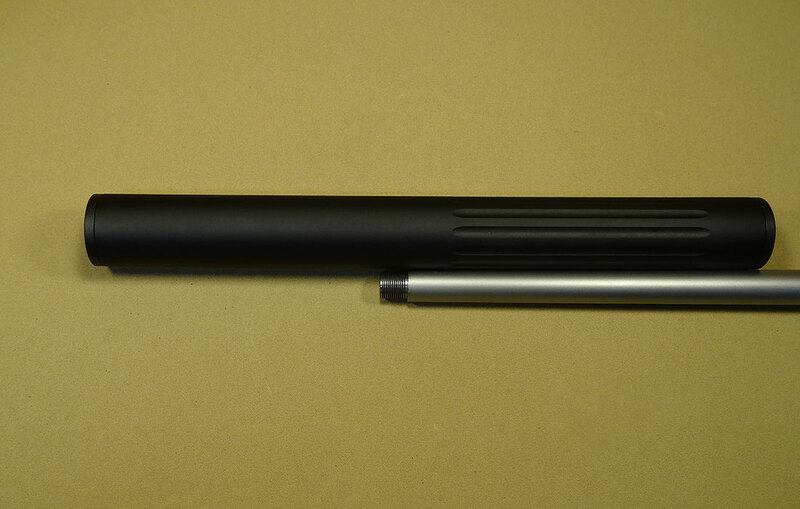 As we manufacture all of our silencers, we can offer you customised variations of the standard dimensions to suit your particular need. So should you need more of the silencer forward or rearwards over barrel, then these are possibilities but it is best to contact us to discuss your best option for these. The “Hunter”, the “Magnum” and the “Magnum XL” model silencers now have the new and improved 316 stainless steel high efficiency internal muzzle brake. It has an internal design feature that uses the firing blast to encourage the silencer to tighten with each shot. 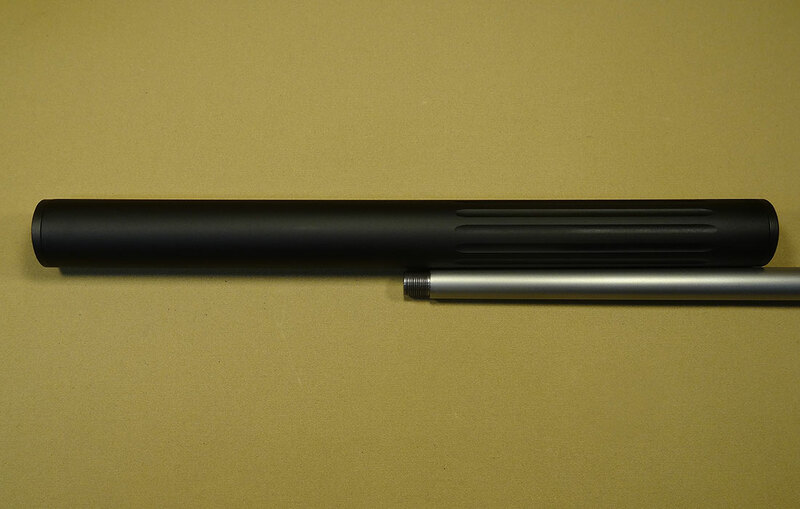 These silencers come standard with a matt black anodised finish. Cerakote finishes are available from an additional $50.00. The bullet exit cap on the end of the silencer comes with engraving on it that details the specific projectiles that are suited to that particular silencer, this allows you to correctly identify what size projectile are most suitable for that silencer. The Greystone Guns Hunter model silencer is the smallest centrefire silencer that we produce, although capable of withstanding the blast of 300 Win Mag this silencer is best suited for calibers of 308 capacity and below and is a very popular choice on AR15’s, SL8, AK47 and Mini 14’s or any rifle requiring a short light weight silencer. The Greystone Guns Magnum model silencer is our most popular centrefire silencer, giving great decibel reduction from the smallest 17 cal right up to 300 Win Mag and impressive recoil reduction as well. The Greystone Guns Magnum XL model centrefire silencer really starts to show its benefits on the magnum sized calibres, with its larger internal capacity and more baffles forward of the muzzle. These additions help it reduce both the noise and recoil reduction more than the Magnum series silencer and for only a little more weight and silencer forward of the muzzle.